When John-Michael Sanchez and Natalie Burke decided to open a restaurant in January of last year, they were ready for the challenges that owning such a business would bring but they were not expecting another challenge to hit their lives. The same month that Slice was meant to open, Burke was diagnosed with cervical cancer. The setback wasn't enough to crush their dream however so after battling and winning out against the cancer, the couple continued to pursue the opening of the deli/cakery combo. Burke had been running a well-received custom cake business prior to the brick-and-mortar concept so it just made sense to put the two together and realize their dream of a from-scratch restaurant. Situated in Fountain Valley, Slice opened its doors recently to a welcoming crowd, and we were invited in to take a peek at what made up the pair's vision. The "from scratch" part is very important to the two as everything that they can influence is made in-house daily from the breads to the curing of meats to the sauces for slathering. Developed by Executive Chef Julio de Leon (alongside pastry chef Aldo Mendiola), the menu gears heavily towards classic American cuisine but with a focus on ingredients that are as humanely-raised and locally sourced as possible. Offerings including a variety of item types from salads to sides to sandwiches to dinner-heavy entrees and that's not to mention the cakes made in traditional European fashion. 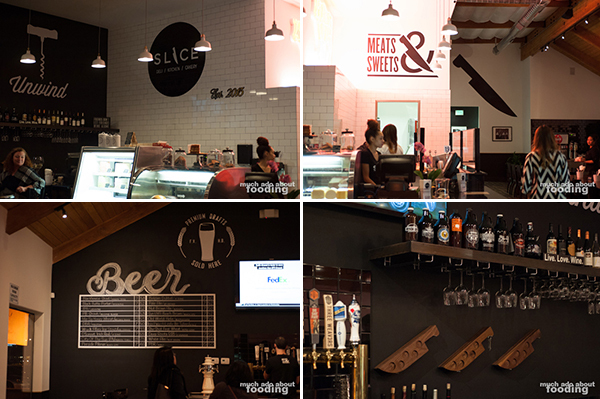 We were particular impressed to see such an emphasis on beers on tap as well - boasting 20 taps that celebrate OC breweries, Slice might just be able to slake your thirst while also serving up packed sandwiches and decadent cakes. In addition to the multiple beers available, Slice also got a notice from us for its sleek and chic design, focusing on modern design, clean black artwork, and the juxtaposition of brilliant white tiles to black chalk-like walls. At Slice, there is no lack of appetizer nor side options, making choices easy for those who are particular about how they want to start off. 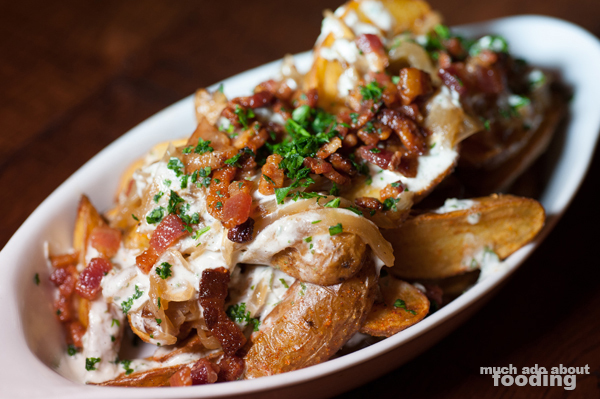 We were lured into the Loaded Fingerlings ($6 - fingerling potatoes, caramelized onions, horseradish creme fraiche, and Nuekes bacon) which reminded us of loaded potato skins but with the kick of horseradish to withstand any feeling of being too heavy. If you have a hankering for something savory and salty, these are your best bet. 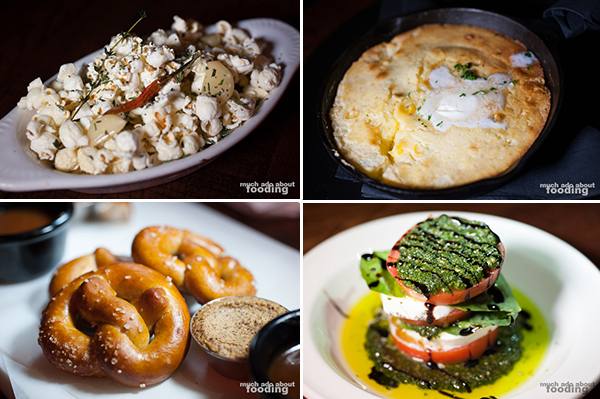 To share, you have the finger food possibilities of Savory Popcorn ($5 - thyme chili oil, garlic, and rosemary), Corn Bread ($6 - charred corn, buttermilk, jalapeno, and maple whipped butter), or Pub Pretzels ($7 - housemade pretzels with stout mustard and caramel) among other things. If you are a cakey cornbread lover, you might dig on Slice's version which was also very moist; if you can appreciate a well-made warm pretzel, Chef Aldo's were a great hit with the group. 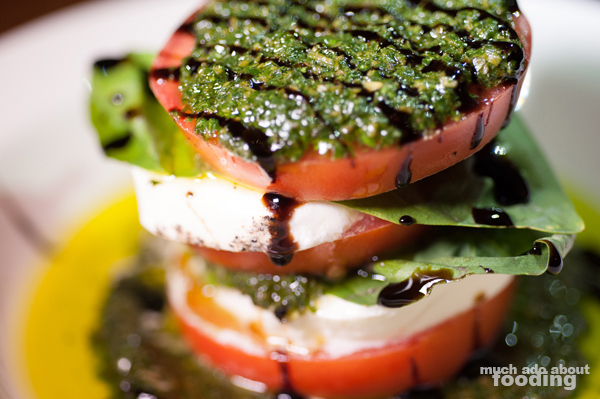 I, for one, like to go for lighter choices for my appetizers so their Sliced Caprese ($8 - fresh tomatoes, basil, and burrata) was more up my alley though the listed burrata was mozzarella when we tried it. The copious amount of pesto on each slice of tomato and cheese was quite good here. 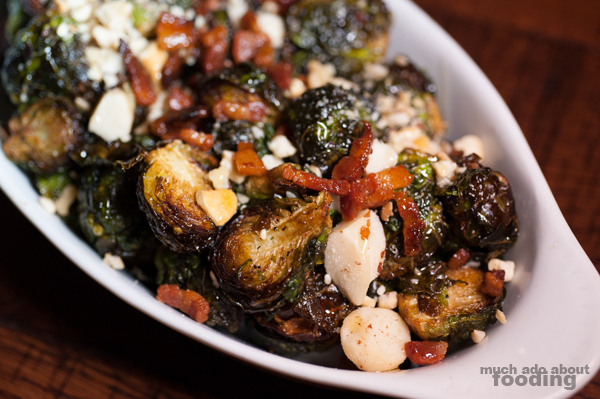 Though I enjoyed the healthy path of a stacked salad, I couldn't quite say no to the Fried Brussels Sprouts ($6 - bacon, hazelnuts, honey, and pepper) once it came out because its great roasted flavor was undeniable. Toss in roasted hazelnuts too, and you've got yourself a hit. Now, one has to note that Slice is open for both lunch and dinner. That means separate menus. We got to try out two of their sandwiches, and with the two choices, Duc and I found our own preferences. 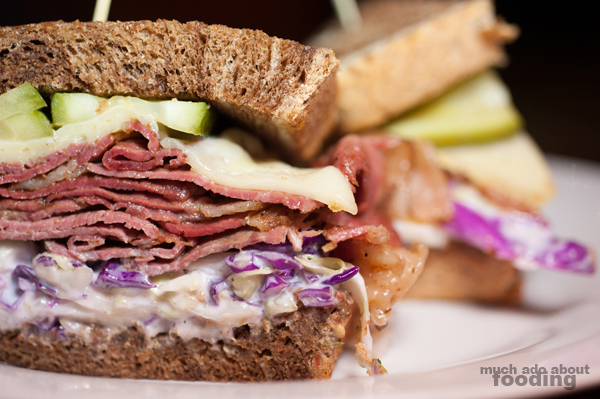 The Pastrami-Mami ($11 - signature marbled rye, house-cured and smoked brisket, Greek yogurt coleslaw, Havarti cheese, house pickles, and chocolate stout mustard) satisfies the meat-lover with its generous helping of housemade pastrami but it is cut through with a bit of the Greek yogurt, making each bite feel a little less guilty. 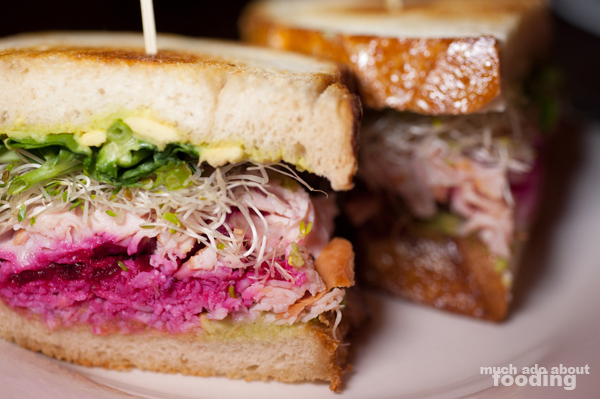 I, however, really appreciated their Freebird ($10 - smoked turkey, alfalfa sprouts, pea shoots, beet horseradish, avocado mash, on San Francisco sourdough) which puts a personal spin on a typical turkey sandwich. The alfalfa sprouts really made a textural difference, being crisp and cool, while the beet horseradish kicked up the turkey a notch. Add in the avocado mash and the familiar tang of good sourdough, and you have a winner of a sandwich. Dinner time is significantly different from lunch at Slice, and we got to sample a few of their much more savory dishes. 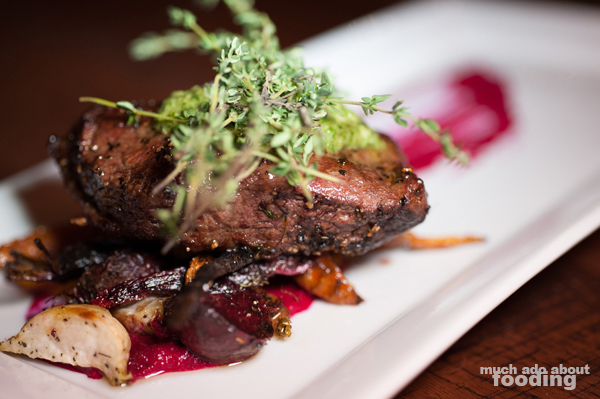 To start, the London Broil ($14 - 8oz natural Prime flat-iron steak, French salsa verde, and pickled onions) was a succulent piece of steak that was accompanied well by root vegetables. 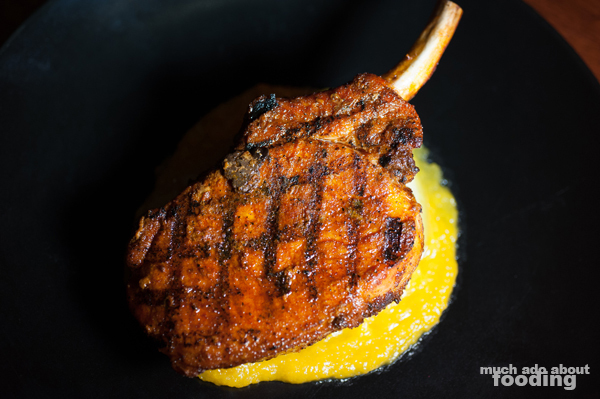 We really enjoyed their Tomahawk Pork Chop ($14 - maple apricot gastrique, herb compound butter, and caramelized Bali pears) which was so soft and juicy, it was a wonder. While I wouldn't necessarily call the smear they had on the plate a true gastrique, the accompaniments with the pork made sense, pairing a sweet fruit next to inherent subtle sour in pork. Finally, we were treated to their Porchetta Roast which is brought out only when pre-ordered or during special occasions - the crisped pork belly wrapped around a pork loin slow-roasted for at least 48 hours made for an impressive presentation and also lovely taste. 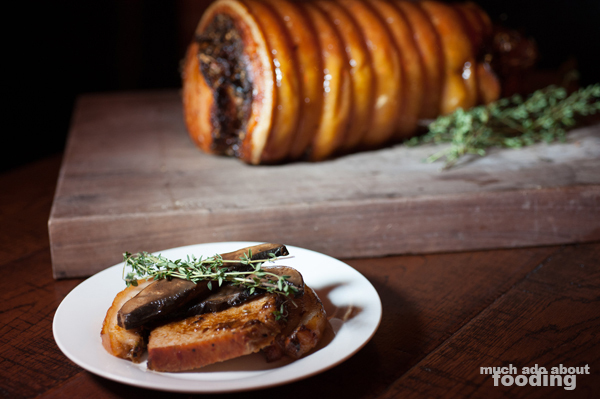 Topped with large grilled and sliced Portobello and rosemary, the porchetta found its way clean off everyone's plates quickly. We're excited to see when this will be brought out in full force in the future. As for the cakes, there is no denying that the cakes have put Slice on everyone's radar. 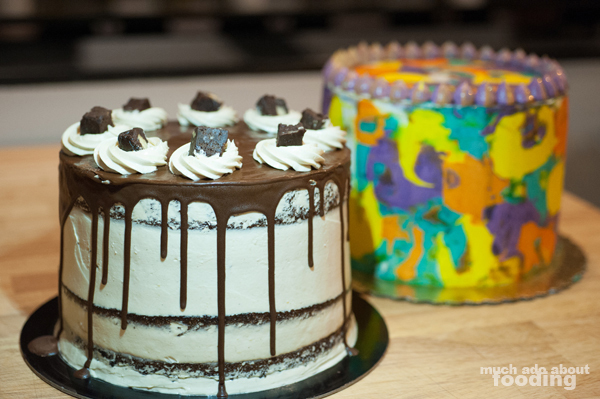 Stemming from Burke's previous popular business of making custom cakes, Slice Cakery has fresh made behemoths of cakes that can be bought to-go or even ordered ahead of time for pick-up. If you're dining inside, make sure to get a slice of one. We tried out their blueberry coconut, peanut butter chocolate, and everything cake flavors; the technique used to produce each results in very moist and dense cakes with European buttercream. The most jaw-dropping of them all was Burke's famed Everything Cake which has multiple layers of multiple flavors of cake inside and is covered by naturally-dyed frosting that possess their own flavors as well. Even if you're not in for the food, you should at least try a slice of cake at 8780 Warner Ave. Suite 15, Fountain Valley, CA 92708.